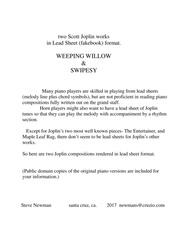 two Scott Joplin works in Lead Sheet (fakebook) format. Many piano players are skilled in playing from lead sheets (melody line plus chord symbols), but are not proficient in reading piano compositions fully written out on the grand staff. Horn players might also want to have a lead sheet of Joplin tunes so that they can play the melody with accompaniment by a rhythm section. Except for Joplin’s two most well known pieces- The Entertainer, and Maple Leaf Rag, there don’t seem to be lead sheets for Joplin’s other works. 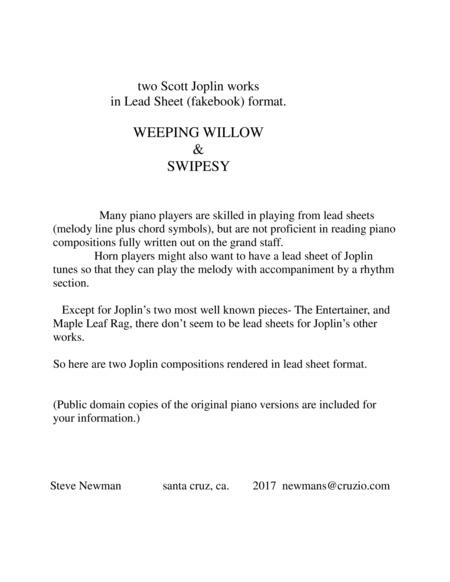 So here are two Joplin compositions rendered in lead sheet format.